The fire reportedly erupted when a train hit one of the station’s platforms. At least 12 people have been killed and several others injured by a large fire at the main railway station in the Egypt’s capital, Cairo. 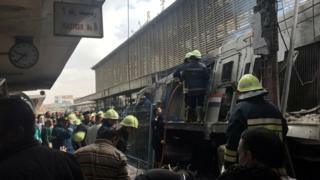 Security sources said the fire erupted when a train hit one of the platforms at the central Ramses Station. Dozens of ambulances and fire engines have rushed to the scene. Videos and photographs posted online showed clouds of black smoke billowing from the station and what appeared to be charred bodies on a platform.